One of the Jena 6 members, Mychal Bell reportedly accidentally shot himself in the chest and had to be taken to the hospital. A teen convicted in the “Jena Six” beating case shot himself in the chest and was taken to the hospital Monday, days after his arrest on a shoplifting charge, police said. Mychal Bell’s wound isn’t life threatening, said Monroe Police Sgt. Cassandra Wooten. The 18-year-old used a .22-caliber firearm in the shooting around 7:40 p.m., she said. Wooten believes Bell was upset over media coverage of the arrest last week. Mychal Bell, the 17-year-old black teenager whose arrest and detention led to the “Jena 6” protests, has agreed to a plea deal that could lead to his release by June, his lawyer said Monday. Bell was originally charged as an adult with attempted murder in an assault on a white fellow student, Justin Barker, at Jena High School in 2006. He was convicted of second-degree battery, but the verdict was tossed out in September when an appeals court ruled that Bell, who was 16 at the time of the attack, should not have been tried as an adult. He still faced charges in the juvenile system. Under the deal announced Monday, the LaSalle Parish District Attorney’s Office agreed to drop charges of aggravated battery and conspiracy to commit aggravated battery. Bell agreed to plead guilty to second-degree battery. He had to agree that he “hit Justin Barker, knocking him unconscious,” a Bell attorney said. Bell would be sentenced to 18 months of custody in an unsupervised setting, such as a group home or a halfway house. Barker’s family has said his medical bills reached $12,000, but prosecutors apparently plan to seek money from five other black students also implicated in the beating. Bell would have to testify in those cases as part of any plea deal. 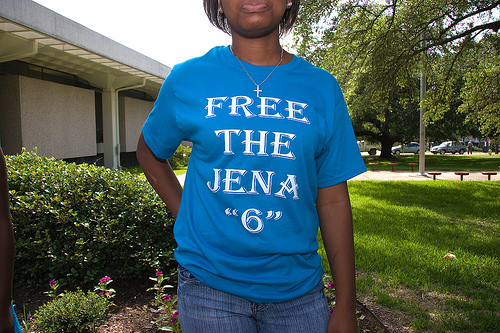 Bell and the other five students, dubbed the “Jena 6,” were originally charged in adult court with attempted murder and conspiracy. The charges were later reduced to battery and conspiracy, and Bell is the only one of the youths to remain in jail. Bell was convicted of the charges against him in July. But judges overturned both convictions, finding that the cases should have been brought in juvenile court. Although he was released in September after his adult conviction was overturned, Bell was ordered two weeks later to spend 18 months in a juvenile facility for a probation violation relating to an earlier juvenile conviction. The fight came after months of racial tension in the town, fueled by white teens who hung nooses from an oak tree on the town’s high school grounds. But prosecutors have said there was no “direct linkage” between the hanging of the nooses and the schoolyard attack that left Barker with injuries to both eyes and ears, as well as cuts. An estimated 15,000-plus demonstrators marched through Jena, about 200 miles northwest of New Orleans, in September to protest local authorities’ handling of the case. Tina Corwin, mother of Bryant Purvis, another of the Jena 6, said she was shocked by the plea deal and said her son will not plead guilty to anything. Mychal Bell of the now historical “Jena 6” case was ordered Thursday to spend 18 months in a juvenile facility, after a judge ruled he had violated his probation for earlier juvenile convictions, a source with knowledge of the court proceedings said. The decision came at the end of a two-day juvenile court hearing that was closed to the media and public. Carol Powell-Lexing, one of Bell’s attorneys, said the judge’s decision would be appealed. Civil rights activist Al Sharpton, who has championed Bell’s case, denounced Thursday’s decision as “revenge” by the judge and called on Louisiana Gov. Kathleen Blanco to intervene. 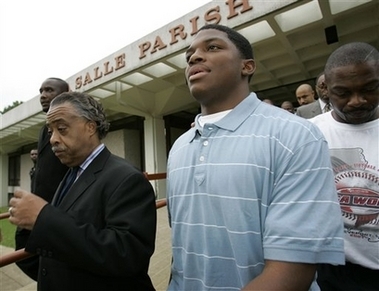 Mychal Bell’s Mother Melissa Bell photographed with Rev. Al Sharpton. 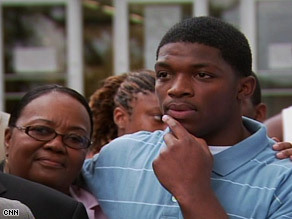 Mychal Bell last Thursday when he was finally released from jail. In an excellent interview with Essence Melissa Bell (Mychal Bell’s Mother) spoke on the serious situation down in Jena and how she feels since the release of her son. Here are some excerpts…. Essence.com: For months you had been fighting for your son’s freedom without success. What was your reaction when you learned that he would finally be released? Melissa Bell: I didn’t want to get too excited until I saw that he was out. When we actually signed the papers to let him out that’s when I really got excited. We’re not fully celebrating because we still have a long way to go, but we were happy to go in there, put some clothes on him and walk him out. Essence.com: How is Mychal doing? Essence.com: Are you surprised by the support you’ve received from around the country? M.B. : I feel very good about it. It’s encouraging to know that so many people are standing behind you and still believe in helping each other. It’s great to see all the civil rights leaders, people in high places and all the thousands of people who came to the march. You sometimes forget that people still love each other like that. We need more of that in the world. Essence.com: How has this experience changed you? M.B. : It opened my eyes to see that you can’t trust everybody because everybody’s not your friend. Things can happen to you in the blink of an eye. Your life can change in one day. It made me think about life more and getting my kids together and getting them right with God. We’re with God, but getting them straighter with God. And I realize that your kids can be taken from you with a stroke of a pen. Essence.com: And what about Mychal? Does he seem different? M.B. : Yes, but not a lot different. He still likes having fun, talking and laughing with his friends, but being locked up for nine months made him grow up a lot quicker and become a man, a better person. He just knows how to handle life better. Essence.com: Have you talked to Mychal about staying out of trouble? M.B. : Oh yes, we’ve been having those conversations for the last ten months. He knows not to get in trouble because he doesn’t want to go back to jail and he knows that people will be quick to get him back in there. He knows it won’t take much for him to end up in jail again. Essence.com: There are reports of White supremacist Web sites posting the addresses of the families of the Jena Six. Have you received any threats? M.B. : I got a hateful letter addressed to Mychal. It didn’t have a (sender’s) name written on it, but it was from Virginia. Other than that, nobody’s bothering me. One of the parents, Bryant Purvis’s mother, got a phone call from some guy who left a message (threatening) her son. Essence.com: Are you concerned about anything happening to your family? M.B: Not really. We have around-the-clock protection since Mychal’s been out. We have undercover state police around the area. 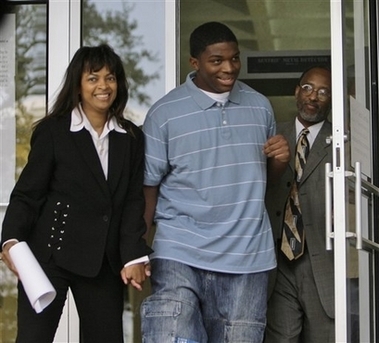 Essence.com: This month, Mychal’s case will be tried in juvenile court. Do you think this trial will be different from the previous one? M.B: Oh yes, I know it’s going to be different. I know that for a fact. I have an attorney that’s going to fight for Mychal. It isn’t like it was last summer. Essence.com: How was it last summer? M.B. : It was an all-White trial. There weren’t but two Black faces throughout the trial and that was Mychal and the lawyer. The witnesses, the jurors, everybody was White. That was the first problem. The lawyer he had then was appointed to him and didn’t call any witnesses. I know the lawyers we have now are ready to take care of business and they will. Essence.com: What can people do to help? M.B. : We’re still trying to get financial help. We will need to pay our legal team. Right now we have a bank account open for the Mychal Bell Defense Fund. Mychal Bell finally let out of jail on bail!!! Finally a little bit of justice is starting to be wrought down in Jena Louisiana!!! Mychal Bell the last of the Jena 6 was finally released out on $45,000 bail today after sitting in jail since he was arrested for the school fight back in December. Thanks Rev. Al Sharpton, Jesse Jackson, and the millions of supporters, and thousands of marchers!!!! This is a great step toward real justice. I know Bell’s family is overwhelmed with joy. “We still have mountains to climb, but at least this is closer to an even playing field,” said the Rev. Al Sharpton, who helped organize last week’s protest. 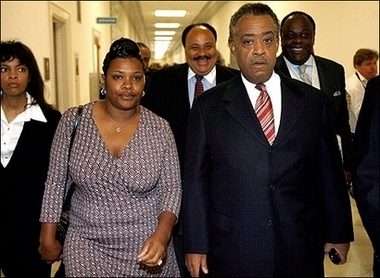 “He goes home because a lot of people left their home and stood up for him,” Sharpton said. An estimated 20,000 to 25,000 protesters marched in Jena last week in a scene that evoked the early years of the civil-rights movement. We don’t care what others say about Al Sharpton and Jesse Jackson being substitute leaders in the shadows of Dr. Martin Luther King Jr. and Malcolm X. They step up and stand-up against injustice. They are true leaders and definitely deserve the respect of the people. Ok now that that speech is over the Governor of Louisiana Kathleen Blanco has finally stepped in and taken a step towards helping Mychal Bell. 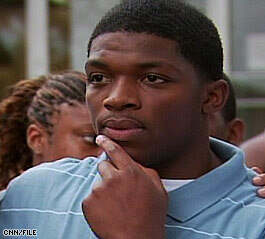 Louisiana judge tosses conviction against Mychal Bell!!! 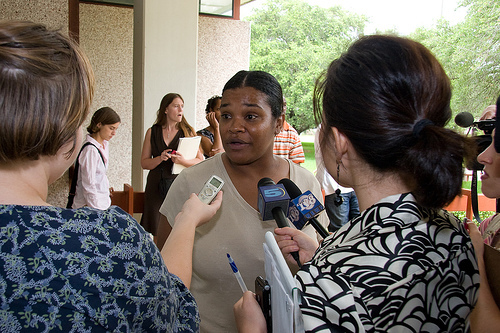 Mychal Bell’s Mother Being Interviewed In Above Photo. Keep on protesting and raising your voice against injustice and oppression and things will change…hearts will be touched…It would just be great if some of the high profile celebrities would intervene, lend their respected voices to this situation down in Jena Louisiana and pay Mychal Bell’s $90,000 bail. Thank goodness that the media has finally started covering this injustice a little bit. Celebrities you don’t need to find a new charity to donate to in order to improve your public image just stand up for these 6 young men down in Jena Louisiana and put pressure on the district attorney and governor to do the right thing.